I’ve played around some with methods of producing and applying the edge finish to the khaki vest. First I tried the separately knit/sewn on band method, using a couple of different approaches to the seaming (fold band longitudinally, sew the band up, then apply it; sew on both sides in one pass; sew on the display side, then do a separate seam to affix the facing side). Of all of them, the last method worked best, but it was the most effort intensive of them all. So I looked further. 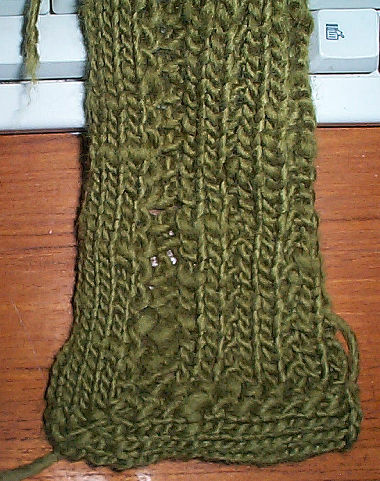 Plain I-Cord (knit on or applied) was too narrow to stabilize the edge, and two courses of it would have been too bulky. I didn’t like the way that picking up along the edge then knitting out looked – especially along the curve of the armhole. Even more experiments ensued. Finally I landed on knitting-on a strip parallel to the edge, then going back and seaming down the free side on the inside of the piece. Doing that I could produce an edge of any desired width, go around curves and even plan on mitering the vest point corner. Here’s a swatch with a mitered corner. Note that I haven’t sewn down the facing on the inside yet, but natural stockinette curl is keeping it nice and neat. 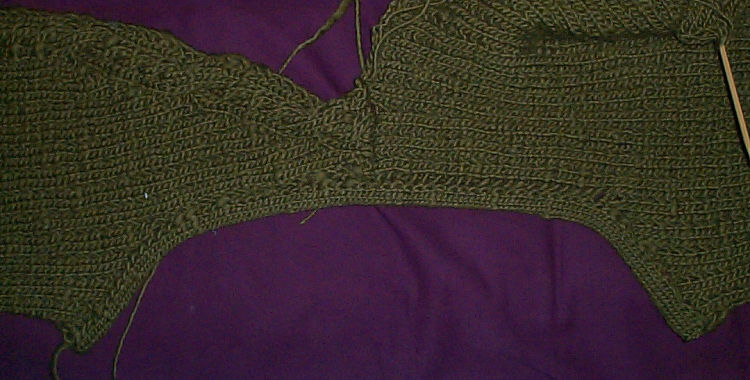 (For some, the inside seaming might be optional, but I plan on doing it on my finished piece). Start with the public side of the work facing you, holding it with the bulk of the piece on the left, so that you’re working up the right side of the thing (upside down from the picture above). Using straight needles, cast on 9 stitches, then pick up one stitch in the edge of the piece being finished. While the strip is 9 stitches wide, one is consumed during joining, so the part that protrudes is really only 8 stitches wide. Row 1 (wrong side): P8, k1. Row 4: S1, k6, wrap and turn. The corner is complete, return to repeating Rows 2 and 3. Optional finish – seam down the inside edge of this facing. I’ve stated applying this same edging to the armholes of my vest (having previously seamed the shoulders). I plan to do the bottom edge next, incorporating the mitered corner on the vest points. But I haven’t played with the buttonhole band treatments yet. Sadly, I have misplaced my copy of InkKNitters. It’s here. Somewhere… Weekend plans include tossing my knitting library to find it. Oh. Unless a monsoon is upon us, weekend plans also include attending the annual Gore Place Sheepshearing Festival in Waltham, Massachusetts. Not a big festival as fiber fairs go, but very local and lots of fun. Look for me with both Elder and Smaller Daughter in tow. Thanks for writing this up. I will definitely keep it in mind for future reference.